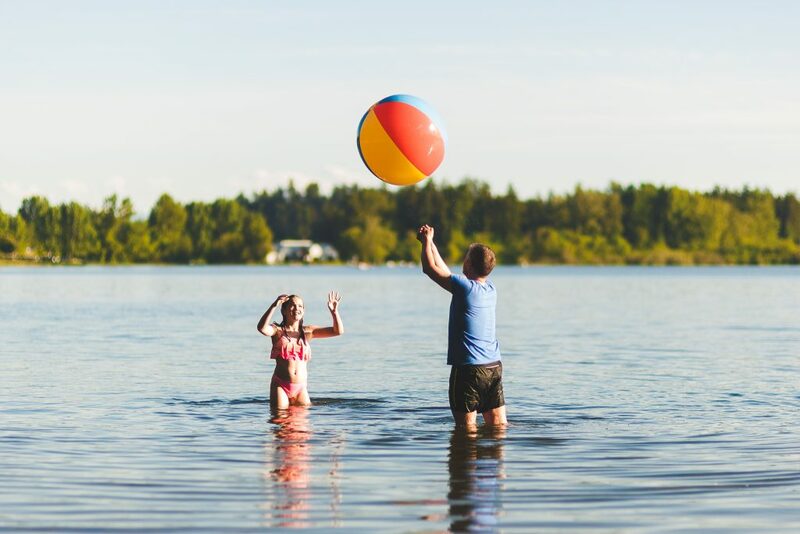 Whether you’re looking for peace and quiet on a trail, or a busy and lively environment on a lake beach, Elk/Beaver Lake Regional Park has it all. Located just 2 km from Travino Elk/Beaver Lake Regional Park, is the perfect place to spend summer day at from sunrise to sunset. The hike around Elk and Beaver Lakes is a 10k circuit through forest, field and wetlands. This is a popular, scenic trail to run or walk. It is mostly flat, gravel or dirt, and is designated multi-use, for hikers, cyclists and horse riders. There is also a connecting trail that extends from the north end of the park leading to Bear Hill Regional Park. 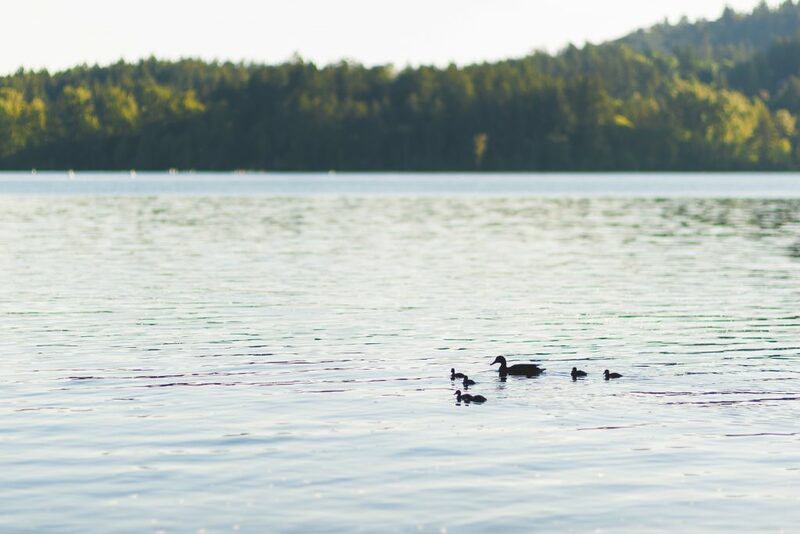 With a stunning view of the Saanich Peninsula and distant San Juan and Gulf Islands, Bear Hill is a beautiful location to sit, relax or picnic. On clear days you can easily spot Mount Baker in the United States. Have you ever seen a red-legged frog? Keep your eyes peeled for animals in the Elk/Beaver Lake area, such as: mergansers, Canada geese, buffleheads, bald eagles, osprey, rainbow trout, smallmouth bass, pumpkinseed sunfish, river otters, red-winged blackbirds, Savannah sparrows, Columbia black-tailed deer, yellow warblers, chestnut-backed chickadees, screech owls, and giant bullfrogs. Plant species in the area include: breadroot, licorice ferns, yellow pond lilies, cattail reeds, cottonwood, pacific crabapple, red alder, Douglas fir, and western red cedar. Concession stands are located at both ends of the park that are open in the summer. At the Elk Lake end, there are also water sport equipment rental shops, and Lakes Grillhouse n’ Bar at 4670 Elk Lake Dr. Looking to Barbeque? Picnic shelters are also available for reservation in regional parks! After your re-energized it’s time for a swim! Swimmers, wind surfers, sailors, water-skiers, fishers and rowers use the lakes cooperatively. There are multiple beaches for relaxing, playing and lying in the sun. Beaver Beach, at the south end of Beaver Lake, has a shallow, sandy beach — perfect for swimming, picnicking and canoeing around the offshore islands. At Eagle Beach you can swim, picnic under the Pacific willow trees, launch your scull from the Rowing Centre or hike south to Beaver Lake. Eagle Beach also has a group picnic shelter near the Elk Lake Rowing Centre. At Hamsterly Beach, join or watch wind surfers skim across the water, and meet the sailors and fishermen, in search of the perfect breeze or searching for their next big catch. There is parking at several locations with accessible stalls at Beaver Beach, Eagle Beach, and Hamsterly Beach. Both Beaver and Hamsterly Beaches also have accessible toilets and playgrounds. You can use the nearby ponds for retriever training, or the Equestrian Centre to exercise and train your horse. Both these areas are under license agreements. For group activities, consult your local retriever or equestrian clubs for access. The old Filter Beds area contains group picnic sites, and provides access to quiet woodland trails. This multi-use trail is 5km (one way), and offers the opportunity to swim, fish, cycle and rest as you explore. It’s smooth gravel surface makes it user-friendly as you enjoy the surrounding forested and lakeshore environments. 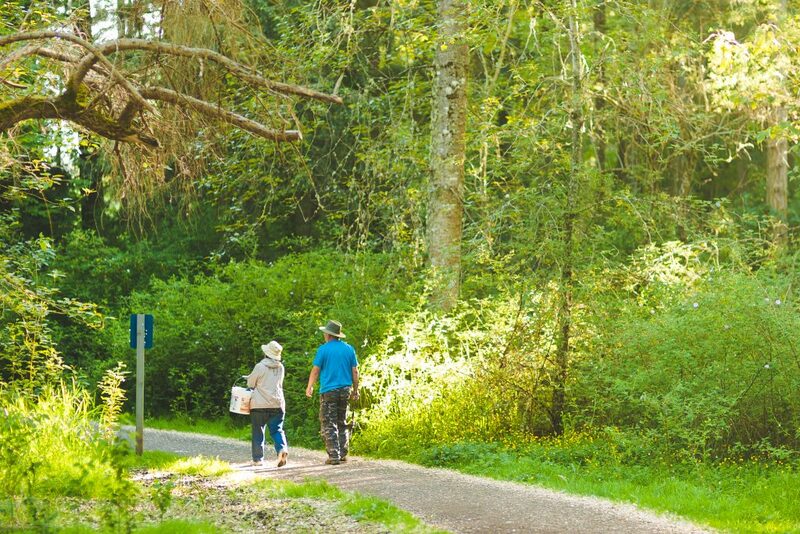 To get to the Filter Beds entrance, from West Saanich Road, turn east onto Beaver Lake Road, and drive 1.2km to the Filter Beds parking lot. From Elk Lake Drive turn west onto Beaver Lake Road and drive 800m to the Filter Beds parking lot. Elk Lake is the training area for Canada’s Olympic Rowing team as well as host to several competitions each year for the local schools. Get your row on, meet local athletes, and enjoy working your way across the lake. 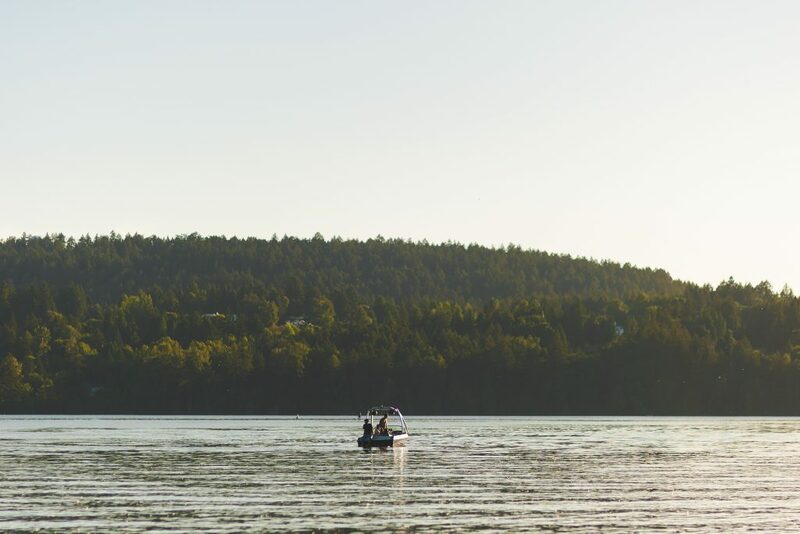 Elk Lake is a large, freshwater lake perfect for swimming, canoeing and fishing. It’s stocked with catchable Rainbow Trout and bass to give you, your friends and family the opportunity to reel one in. Take your kids on their first fishing trip, or enjoy an afternoon with friends floating on the lake. The Victoria City Rowing Club boathouse is located on the southeast corner of Elk Lake. The lake has a fishing pier and two fishing docks; one of the fishing floats also offers access for people with disabilities. 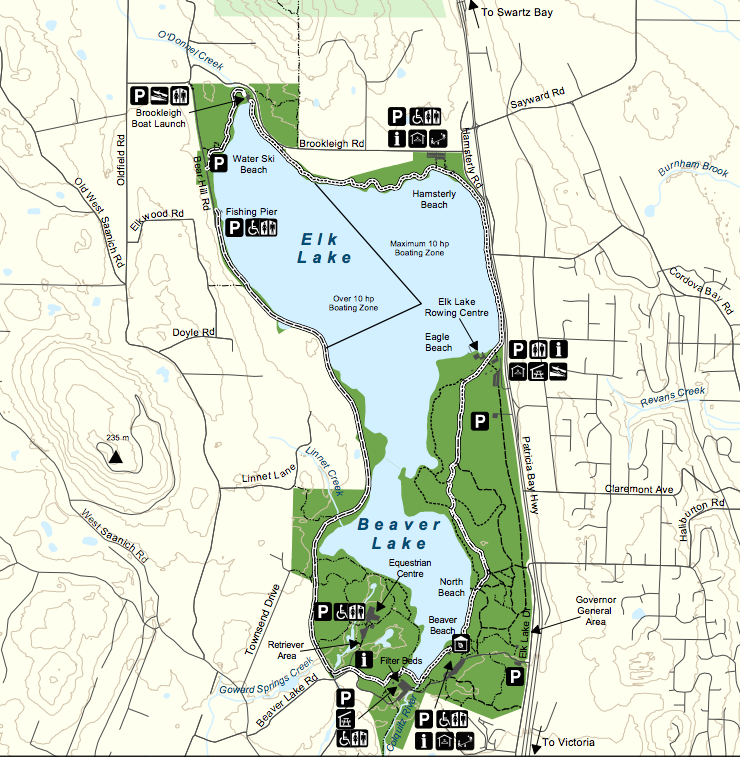 Need directions to Elk/Beaver Lake Regional Park? To find the Beaver Lake Entrance, follow the Pat Bay Highway from Victoria, and take the Royal Oak Drive exit. Turn left on Royal Oak Drive to cross over the highway, then right on Elk Lake Drive to reach the park entrance on the left. To find the Elk Lake Entrance, follow the Pat Bay Highway from Victoria. Turn left on Sayward Road, left again on Hamsterly Road, then right on Brookleigh Road, which leads to the park entrance on the left. To learn more about living at Travino visit our presentation centre or get in touch!